With an increasing understanding on the harmful effects that nuisance noise can have on health and well-being, acoustics has become a hot topic within the construction industry. Jol Berg, Head of Technical at Isover, discusses the importance of achieving good acoustics, and how merchants can inform their customers of the different ways insulation can enhance a building’s acoustic performance. When building insulation was first brought to the public’s attention, the emphasis on energy-efficiency resulted in builders and contractors purposefully specifying insulation that offered a high level of thermal performance and heat retention. However, with an increased focus on health and wellbeing, people are now also placing similar significance on the acoustic performance of a property — valuing homes that provide a quiet and comfortable environment. With increasing land prices, developers are under greater pressure to maximise the value of a site by increasing the density of housing, either through adjoining properties or larger multiple-occupancy buildings, so it is perhaps no surprise that nuisance noise has become a problem affecting many. In fact, surveys have shown that approximately half of the UK population live in areas where daytime sound levels exceed those recommended in the World Health Organisation (WHO) community noise guidelines, and around two-thirds of the population live in areas where the night-time noise guidelines are also exceeded. Local planning authorities are very aware of this issue, often imposing additional planning conditions such as higher sound reduction values above and beyond those specified in Building Regulations. Fortunately, there are a wide range of specialist insulation solutions available that can be specified to meet these planning conditions, and in turn provide the end-user with a comfortable environment to live in. Equally, one way developers can maximise the value of a site is creating additional living areas within the loft space. 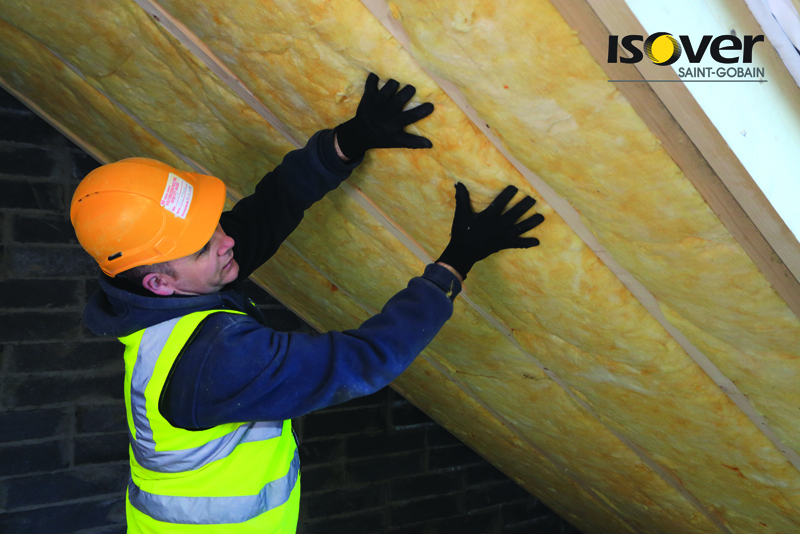 While the loft can be key to maximising space, it is important that installers consider the specialised insulation required for pitched roof applications in order to ensure the space is habitable. Key to this is specifying a solution that delivers a well-insulated and air-tight environment, in addition to offering a high level of external noise protection from sources such as road and air traffic and pedestrians. One solution that is designed for use in pitched roof applications is a specialist glass mineral wool insulation from Isover — Metac. Metac not only provides excellent thermal performance, it can also provide up to 49 dB (Rw) sound reduction in a typical roof construction. Additionally, it is also quick and easy to install, and creates minimal on-site wastage. In larger multiple-occupancy buildings such as flats or student accommodation, all the internal walls of the building play a huge part in delivering acoustic comfort for occupants. Without careful specification and installation of the right internal and separating wall solutions, noise can easily travel from room to room and between dwellings. One way of combatting unwanted noise transfer within a dwelling is by installing a performance tested lightweight partition (usually timber or metal stud), with Isover APR 1200 within the cavity. As an example, the regulatory requirement for internal walls in new dwellings in England is 40 dB (Rw), a partition constructed from a 70mm metal C stud, 12.5mm Gyproc Wallboard and 25mm Isover APR 1200 within the stud zone will comfortably meet this level of sound reduction. If the contractor wanted to increase this level of performance, switching to 50mm APR 1200 in the stud zone with 15mm Soundbloc on both sides would increase the overall reduction to 47 dB (Rw) – a highly perceivable reduction in the amount of sound energy passing through the partition. In addition to walls, Isover APR 1200 is also suitable for use in internal floors, further reducing the noise transfer within a dwelling or occupied building. In order to protect against the potential irritation and stress that a noisy neighbour can cause, another area where high-quality acoustic insulation is essential is in separating masonry walls. With semi-detached and terraced houses being a common sight in our towns and cities, contractors should ensure that they are specifying insulation that is specifically designed for masonry separating walls, such as Isover RD Party Wall Roll, in order to deliver superior acoustic performance and acting as a thermal bypass solution as defined in the Building Regulations. When used as part of one of Isover’s bespoke Robust Detail wall constructions (E-WN-17, E-WM-20 or E-WM-24), Isover RD Party Wall Roll can give a +5 dB improvement over basic building regulation requirements giving contractors a safety margin to work with, as well as improving the acoustics between connecting properties. It is evident that both the industry and customer focus has shifted to consider the acoustic performance of a building to be as important as its energy efficiency. It is, therefore, essential for merchants to be aware of this change in focus, making sure branch staff are well informed of the acoustic insulation products available and how they contribute to the overall quality of a building in order to provide detailed advice and guidance to their customers. For more information on Isover’s range of products and services, visit www.isover.co.uk.